Some very wise person played Carole King’s classic song You’re So Far Away at Amy Winehouse’s funeral. It was reported in the press that it was one of her favorite songs. Could there be a more poignant choice for the celebration of the life of someone who has died so young? (Below, I’ve posted video of King singing You’re So Far Away in 1971.) King’s vibrato is plaintive, her delivery naturally intimate. The song is longing encapsulated in a few hundred words and some simple chords. Magic. Perfection. Like so many others who heard it playing beneath the many news stories about Winehouse’s death, I couldn’t wait to hear the song, once again, in its entirety. To more fully experience the mournful beauty of it. To remember what it felt like to hear it the first few times. 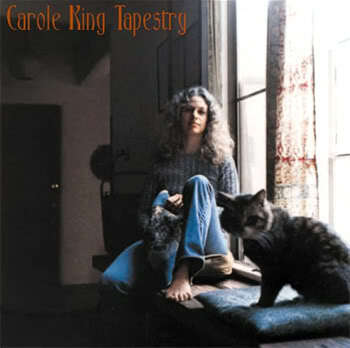 Carole King’s album Tapestry–the one on which You’re So Far Away appears–was on the Billboard 200 for an astonishing 306 weeks and won King four Grammys. I was only nine years old when she recorded it in 1971. The singles from it played on the radio–to which I was already seriously addicted–regularly. But I had little understanding of the songs as belonging to an entire album. The album concept is pretty much antique now. Then, albums were carefully crafted works of theme and musicianship. It was only a little later, when I played the record albums belonging to the families I babysat for, that I understood that they were powerful mediums of emotion and experience. King was only twenty-nine years old when she released Tapestry. She’d already begun an extraordinary songwriting career, and Tapestry helped her break out as a performer. What is it that makes a piece of music or art speak so powerfully to so many people? And how interesting that so many gifted artists are young. Winehouse was terribly gifted. Taylor Swift is still almost a child, but she has a definite skill: taking the immediate, often crushing events of adolescent love and making them instant, if occasionally amusing, memorials. Maybe it’s that we all understand the life-shaping terror involved in being fifteen or sixteen years old. That understanding is something we all carry with us–and when we are reminded, we can’t help but pull it out, acknowledge it, love it or hate it. The best artists are the ones who can tap into the common without making it ridiculous. I think that You’re So Far Away is one of the most intimate, evocative popular songs I’ll ever know. It was lying on my back on the first real carpet I’d ever had in my childhood bedroom. It was closed eyes and frequent tears. It was headphones (bigger than the palms of my hands) snugged onto my ears against the frustration of living. It was a soothing peek into a life I hadn’t yet lived, but knew was coming. It was the promise of friendship and desire. So much desire–or was it hunger for love, or for what I imagined love was supposed to be? It was someone else’s pain that lifted me, gently, compassionately, out of my own. I don’t know what it was for Amy Winehouse. I don’t want or need to know because the memories, thoughts, and images the song evoked for her belonged to her. The lovely thing about a memory is that it is always immediate. It doesn’t thrust us back in time. It’s simply a layer. It’s already a part of who we are. Nostalgia is an incredibly self-indulgent practice–that of wishing to go back to another time. Nostalgia can be shared to a great extent: from vintage-inspired fashions to wistful references to childhood on cereal commercials. But memories are specific to each of us as individuals. We can have shared experiences, but our shared memories of an experience can never be identical. What would a writer be without memory? I never know when a memory will suddenly arise and demand to become a story. The magic–for me and any other prose- or songwriter, painter or filmmaker–is that the reader/viewer will probably never recognize the memory in the work. They’ll never know it as autobiography. Because the memory might be as tiny as a whispered word, a scent, a song, or as big as a newspaper headline or the birth or death of a child. All I know is that, for me, it usually arrives unbidden and surprising and powerful. I’m strengthened by its presence, and moved to take action. And I will take you with me, if I can. Song gives me chills every time I listen to it, truly a beautiful classic. I still put on Tapestry — I feel the earth move, under my feet, I feel the sky tumblin’ down — every 12 months or so. Just to hear album that is so simple, yet so meaningful. Each time, I lament the loss of the LP, and now the CD, and the album as a whole. And now, the novel as a whole. The dying art of reading a novel. Like the past art of listening to an entire album. I long for the past.